I am in the process of nerducating my wife. When she was a kid, her dad told her that Star Wars was stupid because lasers don't make sounds in space, so she believed her whole life that Star Wars was stupid and never watched it. Until just recently, when she fell in love with it. 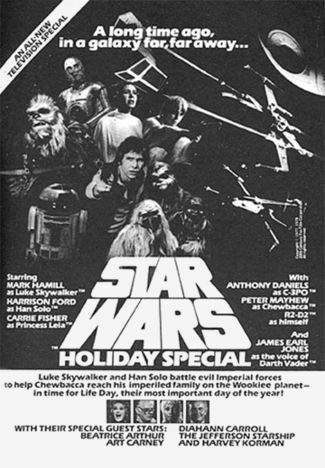 But discussions of Star Wars these days always lead to a caveat that goes something like, "Well, not the prequels. I mean the real Star Wars." This was a sentiment that got its own movie in The People vs. George Lucas. Only 1970s-vintage Star Wars for me, thanks. When it was all awesome! 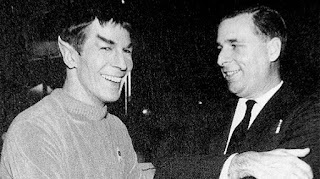 Gene Roddenberry created Star Trek in the early 1960s for CBS Television and was actively involved as Executive Producer on the first 55 episodes of the series. He left the series before Season 3, and the show kinda went a little nuts. Roddenberry got involved again about a decade later and tried to develop a second Star Trek series, but it never took off and the plot was heavily reworked to make Star Trek: The Motion Picture, which is arguably the worst of the six original movies. With Roddenberry absent and Shatner singing "Rocket Man," three people stepped into the void: producer Harve Bennett, writer/director Nicholas Meyer, and Leonard Nimoy. They gave us the Melville-quoting, massive-chested Khan, Spock's emotional death scene (seared into my memory even as a little, little kid) giving his life for his friends, the destruction of the Enterprise (similarly memory-seared), and the crew journeying back to 1980s-era San Francisco to rescue extinct Humpback Whales. I would argue that these three were far better stewards of the franchise than Roddenberry himself, and that the popular success of their emotionally rich storytelling was more responsible for the subsequent spin-off Star Trek series than anything else. Notice that in rebooting the franchise in 2009, J.J. Abrams and writers Alex Kurtzman and Roberto Orci did not negate the emotional growth arc that Spock (Spock Prime) went through in those movies. It is the only thing that remained intact when the timeline was altered. I don't think that was an accident. "Laugh it up, Pointy, but just remember who made you..."
Fellow Nerds-Feather contributor and my former roommate Mikey once went to the UK, and came back with four paperbacks about this wizard-kid called Harry Potter. He handed me the books, I read them in four days, and never looked back. I was a fan. I tried to get my wife to read them, but she refused, saying they would be dumb (I'm sensing a pattern here). But I prevailed upon her, and the next thing you know, we're at an Order of the Phoenix midnight release party, racing home with two copies, and reading them side-by-side into the wee hours. "But wait..." I asked myself then, "are you telling me Harry just lost the only family he had left because Sirius was acting like kind of a jackass?" Hmm... By the time we got to Book 7, I could almost feel J.K. Rowling's loathing for her own characters spilling off the page. Killing folks willy-nilly just to kill them, it seemed like, and then dispatching with Lord Voldemort in maybe two paragraphs. The whole thing felt overlong, a little incoherent, and shoddy to me. I recognize I may be in the minority on that, but subsequent interviews with Jo Rowling bear me out that she was tired of writing the books, wanted to be done with them, and even wanted to kill off Ron because he annoyed her. "Somebody get this red-haired kid outta here or I'll do it myself..."
Enter producer David Heyman and writer Steve Kloves. Heyman spent a decade producing the eight Harry Potter films, and Kloves wrote all but one of them. I will argue that starting with Goblet of Fire -- or possibly The Order of the Phoenix -- the movies became better stewards of Harry's journey and its telling than the novels that inspired them. In the books, the killings-off of main characters infuriated me, but moved me in the movies because the characters died for reasons, they died protecting their loved ones, as Harry would himself have to do, and the series-climaxing showdown with Voldemort was exactly that -- climactic. And though they couldn't fix every problem with the books (Dumbledore's dead, but still gets to explain everything to poor, confused Harry at the end, and I really didn't need the flash-forward to middle age), but they did have the good sense to leave S.P.E.W. out of the movies all together. But Peter Jackson took the books up on the mountain, allowed them to be struck by lightning, and brought the result back down to us in the form of three movies, the likes of which I had never seen before. Watching The Return of the King in the theater on its initial release was literally breathtaking. And even though it ended too many times, it didn't end as many times as the book, so bonus points for Peter, Fran, and Philippa. But now, I fear, they have worn the One Ring for too long, because The Hobbit, shorter than each of the Lord of the Rings novels, will be as long onscreen as the whole other saga was. And that's kind of a bummer. Like with Lucas and Star Wars, I don't know where a created world leaves possession of the one who created it and becomes the "property," if you will, of those who populate it in their dreams and escape into those worlds for countless hours of inspiration, encouragement, and wonder. But one thing I'm starting to realize is that we have it in us to create things that are far bigger than we are, and far bigger than we can control. And often, the people who gave birth to these young worlds are not the best people to raise them. But that's ok, too. One person can only do so much, after all. Except this guy. He can do it all.